Fivethirtyeight's analysis of a Surveymonkey data-set shows that Hillary Clinton would have won the 2016 election if registered Democrats had turned out and voted in larger numbers -- in other words, Hillary's failure to convince registered Democrats to vote, rather than abstain, lost her the election. This echoes the message from the Democratic Party's left wing, represented by Sanders supporters, who argued that Hillary Clinton represented a finance-friendly, militarized, neoliberal continuation of the Obama administration, which failed to jail a single banker responsible for the 2008 crisis (preferring to lavish billions on the sector and largely allow it to continue its reckless and greedy speculation); deported more people than any other administration in history; engaged in a secret, unilateral assassination program in countries where the US was not at war; massively increased domestic surveillance; and charged more whistleblowers with espionage than all other administrations in US history combined. The poll data suggests that the Sanders critique of Hillary as distasteful to the party base was correct: "Trump was able to win, in large part, because voters who disliked both candidates favored him in big numbers, according to the exit polls. Clinton, apparently, couldn’t get those who disliked both candidates — and who may have been more favorably disposed to her candidacy — to turn out and vote." 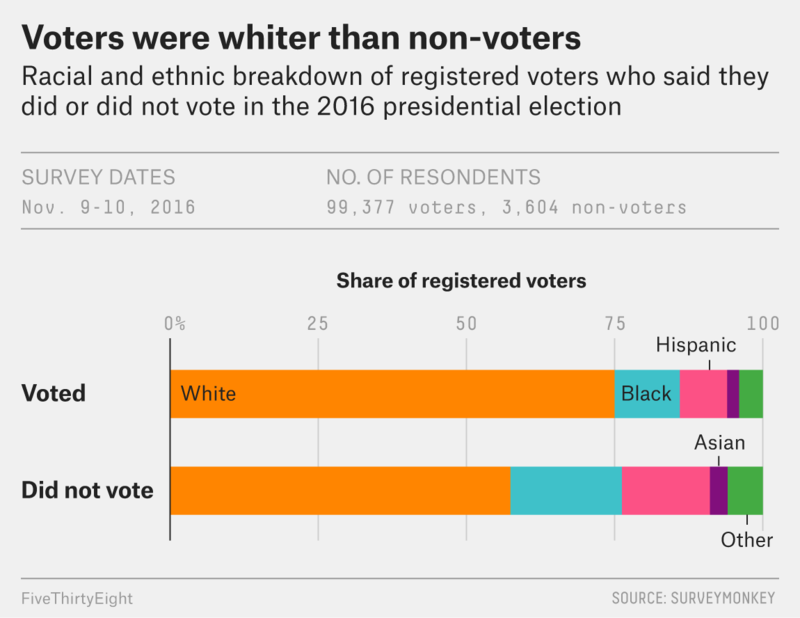 The abstainers were most likely to be nonwhite and/or Hispanic; another major predictor of abstention was being young -- the young voters who registered as voters were not willing to vote for Hillary. Note that these are registered voters: in other words, this is not about voter suppression in GOP-controlled states. If these registered voters -- whose registration was not suppressed by GOP tactics -- had come to the polls, Hillary would have won. Separately, it is likely that a repeal of GOP voter suppression could have registered enough new Democratic voters to make up for the mass abstentions. But it is not fair to characterize this as a voter-suppression problem -- again, even taking voter suppression into account, motivating these voters to go to the polls would have won Hillary the election. More harmful for Clinton was which young voters stayed home: minorities. Among white voters, voters 18-29 years old made up 30 percent of voters who did not participate in the November election. Among young Hispanic voters, that climbs to 43 percent. Among young black voters, it was an even higher 46 percent. That generally matches the findings of the voter data released in some Southern states showing that young black voters were especially likely to stay home in this election. Younger black voters were far more likely to support Bernie Sanders in the primary, suggesting that there simply was not the enthusiasm for Clinton’s candidacy as there was for Obama’s in 2012. Clinton’s favorable rating, for instance, was about 10 percentage points lower among the youngest black voters compared to the oldest black voters in the SurveyMonkey poll. Perhaps most important is the group that voted in much larger numbers than in 2012: white voters without a college degree. (Trump won this bloc 63 percent to 32 percent.) Generally speaking, college graduates are more likely to vote than non-college graduates, even when controlling for race. According to the Current Population Survey, whites without a college degree made up 44 percent of voters who cast a ballot in 2012, and 58 percent of registered voters who didn’t vote.